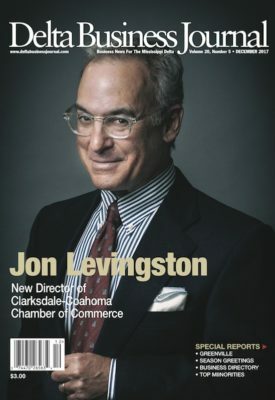 Jon Levingston brings both the experience of a native son who loves his community combined with knowledge of the broader world to his new position as the new executive director of the Clarksdale-Coahoma Chamber of Commerce. Levingston grew up in Cleveland where he credits his parents for setting high standards, including a work ethic honed by starting work at age twelve in the family’s furniture store warehouse. While he has lived in Clarksdale for thirty-five years, he also has lived in Rome, Ga., Athens, Ga., Atlanta, Ga., Richmond, Va., and New York City. His first boss was warehouse manager Thad Jackson. That was true even in times when he was helping deliver furniture that weighed more than he did. Later, working with his father, Douglas, in the family business was a revelation. From an early age, he had a great interest in all the arts, but particularly the visual arts. His mother, Barbara Levingston, and a cousin, Stan Topol, introduced him to a variety of periods in American and European art. Levingston lived outside the Delta for a number of years before returning to Clarksdale in 1983 to help his father with business interests. After his father passed away a few years later, Levingston ran their businesses until 2012, when he sold them. He was invited to join the Rotary Club and the Chamber of Commerce where he learned a great deal about the community, including its need to recruit and retain industrial jobs. One day, while on a buying trip for his company, he overheard the owner of a furniture manufacturing firm complaining about the community in which his factory was located. He told the owner that he should consider moving to Clarksdale. The owner was interested, and through the work of the late Walter Thompson, then president of the Clarksdale Chamber of Commerce, and Pete Johnson, a Clarksdale lawyer and banker who later was elected State Auditor, a visit was set up. Now Levingston is in the position to work full-time to make good things happen for Clarksdale. He has also come to appreciate the extraordinary work of his predecessor, Ron Hudson. Levingston feels all the major Delta towns are special, but that Clarksdale, in particular, has a lot going for it. “It has a unique and historic place in the history of modern popular music,” he says. “So many talented musicians who contributed to the evolution of the blues genre either were born or spent a significant portion of their lives in Clarksdale. Many of the artifacts of their lives and careers remain here, which makes Clarksdale a place of pilgrimage for those who wish to visit the place that helped launch the progenitor of rock and roll. During almost any week of the year, one will find visitors to Clarksdale from as far away places as Europe, Asia, and Australia. Less well known is Clarksdale’s unique role in the history of twentieth century American theater. Young Tom Williams’ (later Tennessee Williams) uncle, Dakin Williams, was the rector of St. George’s Episcopal Church. Levingston said a vibrant arts community is a vital component part of an economically healthy community and enhances immeasurably the quality of life of that community. He also touts Clarksdale’s dynamic food scene, excellent and growing medical community, superb health care facilities and the educational opportunities provided by Coahoma Community College. He also likes to say that Clarksdale is to hunters as Florence is to art lovers. “Our section of the Delta offers superior deer, duck, and dove hunting,” he says. Levingston has been a runner for more than 30 years competing in marathons, half marathons, 10k and 5k races. He and his wife, Jennifer, have married 24 years, and have three daughters.